We lost our 19 year old tortie about 2 years ago; after thinking about it carefully we adopted a kitten in October. I can’t keep her off my kitchen counters. When I cook, I have to shut her in a room and sanitize my counter tops & peninsula. It actually takes quite a bit of time and I’m getting frustrated. I’ve tried the squirt methods, including adding vinegar to the squirt solution, to no avail. The other cat climbed on stuff but she wasn’t that fond of the counters. I of course need some humane ideas. There are some vets who even advocate against the squirt bottle. This is hard to break unless you can devote a bit of time to monitoring the cat. If the cat explores the counter when you are away or not cooking then you’ve lost half the battle. Try to make the counter as unattractive to the cat as possible. Wipe your sink and faucet dry since forbidden water is always more attractive than what is provided in the bowl. Don’t keep anything of interest on the counters like potted herbs or small items that look fun to bat about. When you aren’t actively working in the kitchen cover the counters with rumpled sheets of aluminum foil or some sticky but low tack tape with the sticky side up. Cats don’t like the feel of the tape nor the sound/sensation of the foil. Be consistent with the words “no” and “down”. Combine the spoken word with hand signals. Further combining the command with a loud noise (hands clapping, clicker or speaking with a “growl” in your voice) further emphasizes the point. A mother cat will make her point by biting the scruff of the kitten’s neck and giving a little shake. You can gently mimic the action with your hand while saying no. It’s universal cat-speak and they understand the meaning. The trick with cats is you have to deliver the command when they are in the act. After the fact doesn’t jibe with the kitty brain. 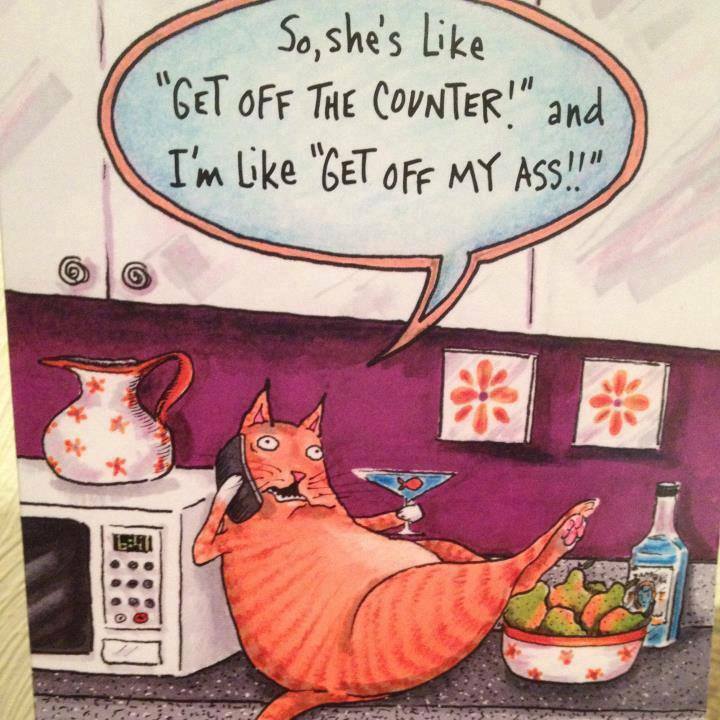 Is the cat doing this while you are working in the kitchen? The cat may just be curious to see what is holding your attention. One solution is to provide a perch (bar stool, etc.) where the cat can watch you. Talk to the cat while you work. Show the cat some of the things. Put on a kitty focused cooking show! They are really curious and we are the major point of interest for most indoor cats. After a while, they either decide the show is boring or they learn to behave in order to watch. OMG - thank you so much for taking the time to compose your post! I’ve never heard or read so many cat tips in one place. Yes, she goes anywhere she wants anytime she wants and bats anything down that she wants. She had a fascination for one of those tacky little hula dolls until she broke it. I glued it and put it back. Shame on ME! I had cats all during my childhood but I’ve never had a cat like this. I suspect she’s from the feral end of the gene pool. Just a scrappy little survivor with street smarts it seems. She’s also not very affectionate but we’re getting there. I seriously considered re-homing but don’t want to do that. On the other hand she is getting used to the two Boston Terriers amazlingly. It’s been a long time since you’ve dealt with kitten energy. When you’ve become used to an older cat you forget how exhausting a kitten can be. Use that to your advantage. The more you interact and play (ie exhaust the little thing) the more closely the kitten will bond with you. A cat that has bonded strongly does not like to see you upset with them. Cats are also extremely habitual and like routine. Create rituals to distract them from unwanted behaviors and to reinforce desired behaviors. People have thought me odd but I have taken vacation time in order to spend the first week together with a cat new to my home. At that point they are checking out the surroundings and checking out the other creatures that live there. It’s the perfect time to reinforce the message that you are the alpha and nip unwanted behaviors in the bud before they become habits. I’ve always felt that spending an intensive first week has really made the rest of our years together much better. And you know you are now required to post a photo of the kitten! I had a very sweet, small cat for 21 years. She never jumped up on the counter or table. I now have two feral cats (OK, they were feral for their first 6 weeks, and have been indoor cats for the last 15 years). Only one jumps on the table, I get up, state very loudly “down,” and point to the floor. She jumps down immediately, but I haven’t found a way to keep her from jumping on the table in the first place. Scolding or squirting the cat makes the cat thinks the problem is associated with you, not the counter, the kitty thinks it’s you don’t allow him to go there. Also tell everybody at home to get them off the counter, not only you. You have to make him associate the counter as an unpleasant place. Some of @meatn3 propose might work. When you aren’t actively working in the kitchen cover the counters with rumpled sheets of aluminum foil or some sticky but low tack tape with the sticky side up. Cats don’t like the feel of the tape nor the sound/sensation of the foil. My cat doesn’t like foil, and wouldn’t go near it. But it doesn’t bother my neighbour’s cat, as I put some around the plants outdoor that I didn’t want him to touch. So test every method, each cat is different. Sticky tape on a big cardboard may work and put the board on a slanted angle, so if he jumps on the counter, the board will slide and falls on floor. I read about piling a few empty cans, the cat jumps and hit them, and they fell with rattling sound…and frightens the cat. Also try to understand why the cat wants to go to the counter. If his aim is just to get your attention or to “play” with him, then squirting him is useless, but renforce the behaviour. My cat when he was younger, went on the counter at night, sometimes to just to get his toy - the rubber seal (for mason jars) to play with. At one point, we had a litter box with cover, and he disliked using that, he prefers to use the kitchen sink instead. Once we changed the box with a no lid one, he stopped visiting the counter. Not related, I still trying to keep cats off the outdoor planters, especially the strawberries ones. I’ve tried so many things, very few things work. Some cats can be very stubborn. At one point, we had a litter box with cover, and he disliked using that, he prefers to use the kitchen sink instead. Good lord. I have A LOT of issues with my cat, but he’s perfectly happy to use his covered litter box. And he never jumps on counters. He does bite, though. Hard. So maybe you actually have a better deal. So test every method, each cat is different. And things can change. When I first brought the Circus Cat home he was too small to be able to jump up on a counter. He did not find me of interest since he had two older cats to follow around. He had become very comfortable by the time he learned to jump high. Consequently he was very good at ignoring me if our desires were in conflict. Once I realized he liked extreme kitty gymnastics we found a way to interact that encouraged him to bond stronger. Then he began to listen to me. That’s also when he gained the honorary title of the Circus Cat! Also, maybe play more the kitty and get her exhausted and sleep, then she will leave you alone when you are working in kitchen. I think you must be the cat whisperer! You are so right about forgetting how much energy they have! Meant to say also that she is extremely food focused. I think she would eat until she exploded. I gave her quite a lot as I could tell she was growing rapidly. I’ve cut back slightly and will raise the issue with the vet. When she was younger she would jump on us with all claws out to see and try to eat our food. I always fed her before we ate, and luckily she doesn’t do that anymore. I looked like a pin cushion. Great advice from all and thank you. Heartily agree with you meatn3 re the time they require when they’re little. I am training a baby Boston right now & am caring for the adult Boston. Pet sitting for the daughter who has a high stress job and works long hours. I truly consider it as my full time job. Puppy needs watching constantly when he’s awake. DH is cooking and shopping along with his demanding job. Never a dull moment. This will give me a good chance to work on some cat behaviors too. I have & do spend a lot of time with kitty and of course play. Too funny not about your arm though. I had very similar wounds too as well as all up & down my legs. 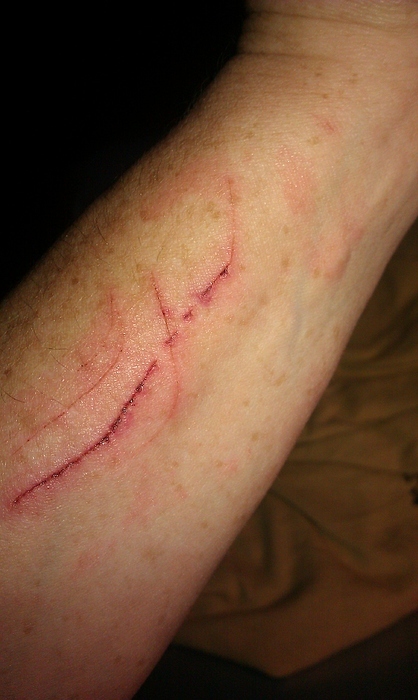 I felt compelled to explain them, I guess it should be elder abuse by felines. Oh golly, chiming in here on the side of patience. May last two are half-Siamese, and lord have mercy. Took a while (ahem) but as we bonded they became more obedient because they wanted to please me. Interestingly, neither one are voice-responsive. I use hand gestures. Snapping my fingers means get down. A tap on the floor after they obey means come here fore a reward cuddle. Now tapping anything means “good” to them.